Despite the huge fires this week, the 38th Cape Town Cycle Tour will take place on Sunday albeit over a 47km distance instead of the usual 105kms. With all the cyclists needing to carbo-load, I wanted to find an easy dish that could be suitable. I have recently brought in some gluten-free instant Risottos, with different flavours including some with truffle flavour. These can be cooked in 15 minutes and are very tasty. The recipe I made takes a bit more time but has that little extra flavour. Whichever you use, it is easy to make and will help the cyclists on their race. The mushroom cap is filled with melted butter and mushroom juice and adds beautifully to the risotto. The wine to accompany this dish should have a good flavour but not overpower the taste of the truffle risotto. I decided that a white wine from the hills of Roussillon in the very hot, southern part of France, would work well. Therefore I paired it with a Chapoutier Bila-Haut Blanc 2013. It is blended from Grenache Blanc, Grenache Gris and Macabeu. This is an easy drinking wine, which, despite its youth is very smooth. The colour is pale with green reflections and it has a taste of grape fruit and pineapple. 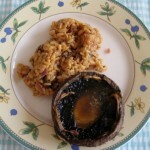 It held its own well with the heady risotto flavours. Melt 100g butter in a large, heavy based saucepan. Clean the mushrooms with a brush. Carefully remove thick stalks from mushroom cap, trim off any dry end from the stalks. Chop stalk into small pieces and add to onion mix and continue cooking gently for about 5 minutes. Add sufficient stock to just cover the rice, stir, then simmer gently until liquid has been absorbed. Continue adding spoonfuls of stock to the rice until all the liquid has been absorbed. The minimum cooking time is 15 minutes but you can allow it to continue cooking gently as long as you chose. Watch it does not stick to the pan. If it gets too dry after stock has been added then add a bit more water and wine. Cut 100g butter into small pieces and dot this acros the inside of the mushroom caps. Place mushrooms caps under a medium grill and cook gently until soft, about 10 minutes, then keep warm. Once risotto is cooked add 2 tablespoons of grated Parmigiano and 50g of butter and stir in. Place rest of Parmiginao in a small bowl. Serve Risotto hot accompanied by the the mushroom caps and the grated Parmigiano.